After several years working in the multimedia industry, Thomas Fundneider headed a private research and development lab that developed software for the Internet and for telecommunication companies. In 2005, he started the consulting company tf consulting, specializing in innovation and strategy design. In 2012, he co-founded the innovation agency theLivingCore GmbH, focussing on radical innovation and Enabling Spaces. 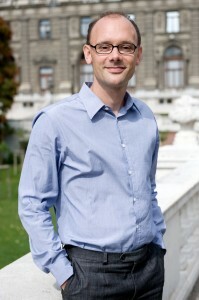 He is actively involved in several Austrian start-up activities as well as regularly lectures at Universities (Universität der Künste, Berlin; Johannes Kepler Universität, Linz; etc.). My field of research is based around the questions of 1) how can we design social systems that thrive as stability and renewal are integrated in their core, and 2) what are leverage points or enablers that bring forth game-changing innovations. I am fascinated by the holistic approaches of systems theory, since this explains real life actions much better than for example mainstream business management literature. Further, these approaches are backed up by a vast amount of profound literature. In my view, the challenge of this field is to attract younger academics and practitioners. Systems theory is rarely referenced in other scientific fields, although it could provide relevant input. The field of innovation obviously has an impact on society. However, one must be careful, as innovations are not always good – although, media permanently tells us so. The question is from where do you start with innovation activities. Is the New linked to deeper values and sustainability issues or is based on a financial perspective only? For example, we are currently working on the realization of a creative settlement project outside Europe aiming to impact society on the topics of freedom, entrepreneurial spirit and openness. Please answer the three questions regarding your responsibility with one of the organizations within the systems movement. 1. What does the Change the Game Initiative mean to you? A place of valuable and trusted persons. 2. Why should other people show interest in the Change the Game Initiative? What will they experience or learn? The Change the Game Initiative is driven by the activities of its members. So, it is not a passive “wait and see” attitude but an initiative-driven mindset that rules. Learning from other fields through distinguished individuals is apparently a key asset that the Change the Game Initiative offers! 3. What is your current position or responsibility with the Change the Game Initiative? I am member of the advisory board and thus support the Initiative in mostly strategic issues.